Our product range includes Laser Cutting Machine, Metal Laser Cut, Laser Cutting Machinery and many more. Laser cutting is applied for different kinds of materials like Stainless Steel, Mild Steel, and Aluminum etc. where it require precise, fast and force-free processing. Lasers create narrow kerfs and thus achieve high-precision cuts. Compared to alternative techniques like die cutting, laser cutting is cost-efficient already for small-batch production. More up to date CNC Metal Laser Cutting Machines offer an assortment of cool highlights. Some can even haul Nitrogen out of the air to help in the ignition and vaporization forms. To discover more about the CNC laser cutting machines, ask an organization who offers this sort of apparatus. They will have the capacity to better answer any inquiries that you have and will guide you to the machine that is ideal for you. For the normal individual, materials’ cutting is an extremely straightforward idea to get a handle on. The reason is straightforward and that will be that their involvement with slicing has a tendency to rotate around normal consistently things. CNC Laser Metal Cutting Machine is applied for different kinds of materials like Stainless Steel, Mild Steel, and Aluminum etc. where it require precise, fast and force-free processing. Lasers create narrow kerfs and thus achieve high-precision cuts. Compared to alternative techniques like die cutting, Laser Cutting System Machinery System is cost-efficient already for small-batch production. 1) CO2 sealed slab Laser Technology. 2) Laser Pre-mix Gas Bottles Not required. Saves cost and Space. 3) No Pre Heating required prior to start. 4) 48 months Pro Rata WARRANTY. 7) No moving Parts, less maintenance. 8) Low standby power consumption. 9) We provide meniscus focusing lenses. In addition we are also dealing in products like Laser Cutting System Machinery System Machine, CNC Laser Cutting System Machinery System machine, metal Laser Cutting System Machinery System machine, CO2 Laser Cutting System Machinery System machine, laser metal cutting machine, sheet metal Laser Cutting System Machinery System machine steel Laser Cutting System Machinery System machine, metal cutting laser machine, Laser Cutting System Machinery System machine metal. The word laser is utilized as a typical name; however it is really an acronym that stands for Light Amplification by Stimulated Emission of Radiation. It can be effectively controlled by mirrors and focal points and basically as light. It can go at the most astounding pace conceivable, can go in a straight line in a void space and can transmit data. With these properties of laser light, laser has discovered various uses; among them is in cutting. A CNC laser cutting machine works by centering the tremendous measure of vitality it delivers on a little territory. The steady light emission that hits the zone makes it dissolve or dissipate. A cut is created by moving the protest being cut or by moving the laser shaft over the surface. The secret for this decisive technology is the two water cooled electrodes & the high frequency between these two electrodes leads to simulation of the laser gas. The optical resonator is formed by the front & rear mirrors & also between two electrodes. The heat generated in the gas is dissipated by the water cooled electrodes. Thus as in conventional cutting gas circulation systems involving routes, blowers or turbines are not required. The main advantage of this technology is that the laser gas neither needs to be circulated nor to be renewed permanently i.e turbines & blowers susceptible to deterioration & service are eliminated. Thus optic integerated in to the resonator that are contaminated by flowing laser gas. Fiber Laser Cutting Machines will lessen the measure of work that you should do, which thusly, enables you to start generation that day. Making numerous cuts inside a similar sheet of material is simple. There will be ties that will hold the majority of the pieces together as the machine proceeds and afterward finishes the cutting procedure. The administrator at that point should either shake the sheet or utilize an elastic hammer to thump the parts free from each other. This is the reason the parts that this machine makes are called "Shaker" parts. Exact cuts are made. In any case; the machine won't utilize the majority of the accessible material inside the sheet, making waste inescapable. Product introduction : CNC Fiber Laser Cutting Machine works on the principle by heating the material at the focal point of the focused laser beam above its melting point. The resulting molten material is ejected either by a coaxial gas jet or the induced vapor pressure, thus forming the cut kerf. It is an technology through which we can cut material like Stainless Steel, Mild Steel, and Aluminum etc. where it require precise, fast and force-free processing. Lasers create narrow kerfs and thus achieve high-precision cuts. Compared to alternative techniques like die cutting, laser cutting is cost-efficient already for small-batch production. CO2 SEALED SLAB Laser Technology. Laser Pre-mix Gas Bottles Not required. Saves cost and Space. No Pre Heating required prior to start. 48 months Pro Rata WARRANTY. No moving Parts, less maintenance. We provide meniscus focusing lenses. 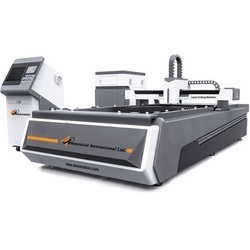 The Slab Techno Laser Cutting Machine in which we are dealing is based on slab type cutting technique which is an precise cutting technique. 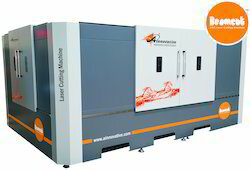 Laser Metal Cutting Machine works on the principle by heating the material at the focal point of the focused laser beam above its melting point. The resulting molten material is ejected either by a coaxial gas jet or the induced vapor pressure, thus forming the cut kerf. Laser metal cutting machinery plays out a few assignments including punching, stamping, forming and twisting. They are for the most part used to cut external part and mind boggling inward forms. Beat laser machines then again deliver high power yield for brief period. They are perfect for penetrating due to their capacity to deliver high power yield in a brief span. Amid the cutting procedure, the laser shaft makes the correct inclusion. Because of the force of the shaft, the cuts don't irritate sub-atomic setup of the protest. Consequently, no splits or broken surfaces are shaped. The procedure is consistent and requires no after treatment. The laser cutting machine available to us is basically used for all profile cutting in metal sheets like M.S, S.S etc. MS Laser Cutting Machine works on the principle by heating the material at the focal point of the focused laser beam above its melting point. The resulting molten material is ejected either by a coaxial gas jet or the induced vapor pressure, thus forming the cut kerf. In addition we are also dealing in products like Laser Cutting Machine, CNC laser cutting machine, metal laser cutting machine, co2 laser cutting machine, laser metal cutting machine, sheet metal laser cutting machine steel laser cutting machine, metal cutting laser machine, laser cutting machine metal. As a device in cutting, a Laser Cutter has a few applications. Some of its outstanding applications are in medication as a surgical instrument, in make making and lithography as a drawing device, in piece of clothing industry as texture cutter and in metal manufacture as welding and cutting device. Metal Laser Cutting is most normal and most gainful mechanical application. By methods for a laser cutting machine, metals with complex profiles and shapes can be effectively and flawlessly cut. It’s amazing cutting ability and quick cutting rates take out further handling of metals, diminish creation cost and enhance efficiency of specific organizations utilizing the innovation. Laser Cutting India System Machinery System is applied for different kinds of materials like Stainless Steel, Mild Steel, and Aluminum etc. where it require precise, fast and force-free processing. Lasers create narrow kerfs and thus achieve high-precision cuts. 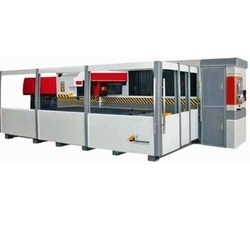 Compared to alternative techniques like die cutting, Laser Cutting India System Machinery System is cost-efficient already for small-batch production. In addition we are also dealing in products like Laser Cutting India System Machinery System Machine, CNC Laser Cutting India System Machinery System machine, metal Laser Cutting India System Machinery System machine, CO2 Laser Cutting India System Machinery System machine, laser metal cutting machine, sheet metal Laser Cutting India System Machinery System machine steel Laser Cutting India System Machinery System machine, metal cutting laser machine, Laser Cutting India System Machinery System machine metal. Metal Laser cutting machinery plays out a few assignments including punching, stamping, forming and twisting. They are for the most part used to cut external part and mind boggling inward forms. Beat laser machines then again deliver high power yield for brief period. They are perfect for penetrating due to their capacity to deliver high power yield in a brief span. Amid the cutting procedure, the laser shaft makes the correct inclusion. Because of the force of the shaft, the cuts don't irritate sub-atomic setup of the protest. Consequently, no splits or broken surfaces are shaped. The procedure is consistent and requires no after treatment. Laser Cutting Machinery System(Beamcut) is applied for different kinds of materials like Stainless Steel, Mild Steel, and Aluminum etc. where it require precise, fast and force - free processing. Lasers create narrow kerfs and thus achieve high - precision cuts. Compared to alternative techniques like die cutting, Laser Cutting Machinery System is cost - efficient already for small - batch production. In addition we are also dealing in products like Laser Cutting Machinery System Machine, CNC Laser Cutting Machinery System machine, metal Laser Cutting Machinery System machine, CO2 Laser Cutting Machinery System machine, laser metal cutting machine, sheet metal Laser Cutting Machinery System machine steel Laser Cutting Machinery System machine, metal cutting laser machine, Laser Cutting Machinery System machine metal. Packaging Details: The Laser Cutting Machinery is dispatched in wooden boxes. Our designed cutting machines are so fast and able to cut various materials. Our experts first test Metal Laser Cutting Machines on various parameters before offering these to our clients. Metal laser cutting machines are ideal for each requirement no matter which metal you want to cut, metal laser cutting machine allows you to cut metals with great precision. Metal laser cutting machines are the best and most cost-effective solution for our clients and we are glad that our manufactures had creates metal laser cutting machines to make your task easier and quicker. Our metal laser cutting machines are widely appreciated by our customers makes us feel proud.